Feeling lonely? Why not Cuddll? Imagine being fresh out of college, with a brand new job in a strange new city. Then imagine that the only space where you can stay in the strange new city is a hostel at such a short notice is in the outskirts. A friendly stray dog and the kirana store owner are the only people you are happy to see you every day. You have no friends, actually you don’t even have any acquaintances and on top of that you are almost broke because your first salary is yet to come in. So it is impossible to go to the club or even out for a nice dinner. This was me in 2013 and the city was Bangalore. I didn’t know any place in Bangalore besides my hostel address and my office of course, I knew two words of the local language ‘kannada gothila’ (I don’t speak Kannada) and was very lonely. Sure, the dating apps were available but they tend to be a little creepy and the amount of effort it took to sort the good from the bad was not something I had the energy to bother with. Things improved after the first few months, office colleagues warmed up to me and we hung out every now and then. But what I was dying to do was to explore the city, have somebody tell me what places to visit and just have bunch of people to talk with on interesting topics. My sister and my bestie faced the same experience when they moved to Pune just last year. They had each other for a while but they were two different people and things wouldn’t end well. Let’s forget about moving into a new city and not knowing anyone for a bit. I am living in the city that I have been born and brought up in and I like meeting new people with similar interests. If I had written Shape of you, these would be my lyrics. I guess we are slowly becoming a lonely generation and despite being hyper connected on social media, what most of us crave is meeting people one on one for genuine conversations. Think about it; where can you make friends these days? You end up being restricted to office colleagues or the people you have grown up with or have been college to. Where can you find someone to dazzle with your fab personality or someone who can just lend a fresh perspective to your life? Social media is one possible place but I have encountered a fair share of creeps along with some genuinely nice people. Which other option do the lonely men and women like me have? The answer? It lies in a cuddll. No, really it does! I am not kidding. 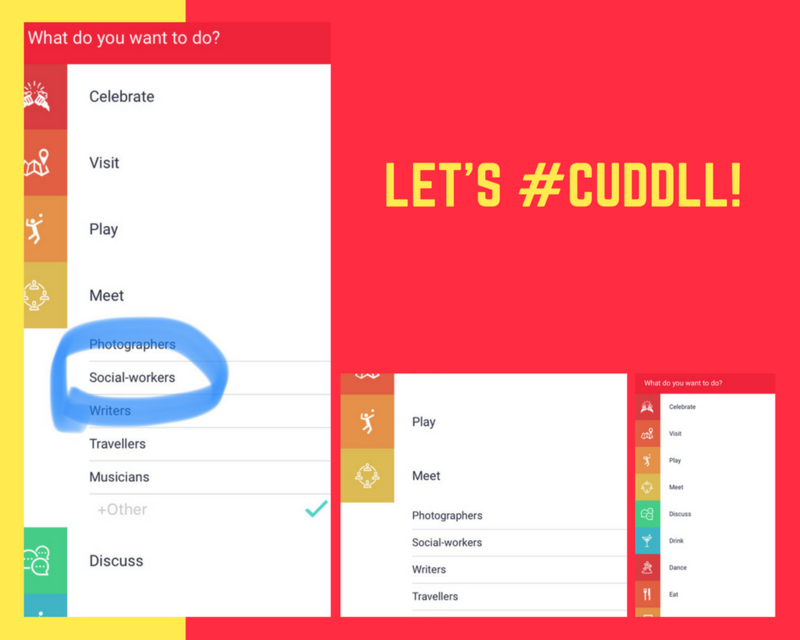 Cuddll, a shiny new app that I have just signed up on helps people discover and meet new and like-minded people. 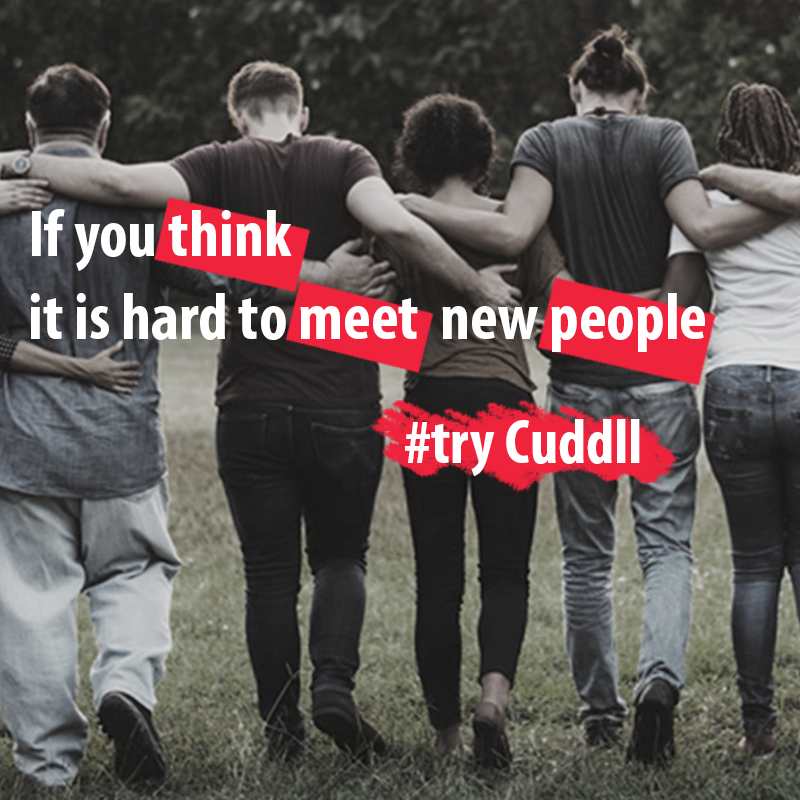 You can sign up for a ‘Cuddll’ (an informal gathering) as well as chat with people to understand them better. The best things in life are free and so is Cuddll. I have realized that group activities and one on one conversations (depending on what you are in the mood for) helps make strangers become acquaintances and acquaintances become friends. I love the fact that it allows me to let go of the pressure of looking in a certain way or swiping people right and left just on the basis of a photograph. There is so much to friendship and love than just a glance right? Top 3 reasons why you should get on Cuddll? I have highlighted a few already but here you go! i) Who doesn’t love a Cuddll? Nope, the best-laid plans are often tossed out of the window for various reasons. I am past the stage now and I think I deserve a reliable Cuddll! The app has several features and I am sure you will enjoy discovering all of them on your own but I want to highlight a couple of them. Conversations: I love to yap on apps and Cuddll allows you to have conversations with people before you join a meet up. BTW, I was going through the different filters on Cuddll and I saw something that made my heart leap me with joy. They had a filter for social workers! Social workers! Social workers! I know I said it thrice but I am super excited about the range of options they have and the fact that they included my profession! I agree with you completely. We don’t have any other place to meet people other than work. 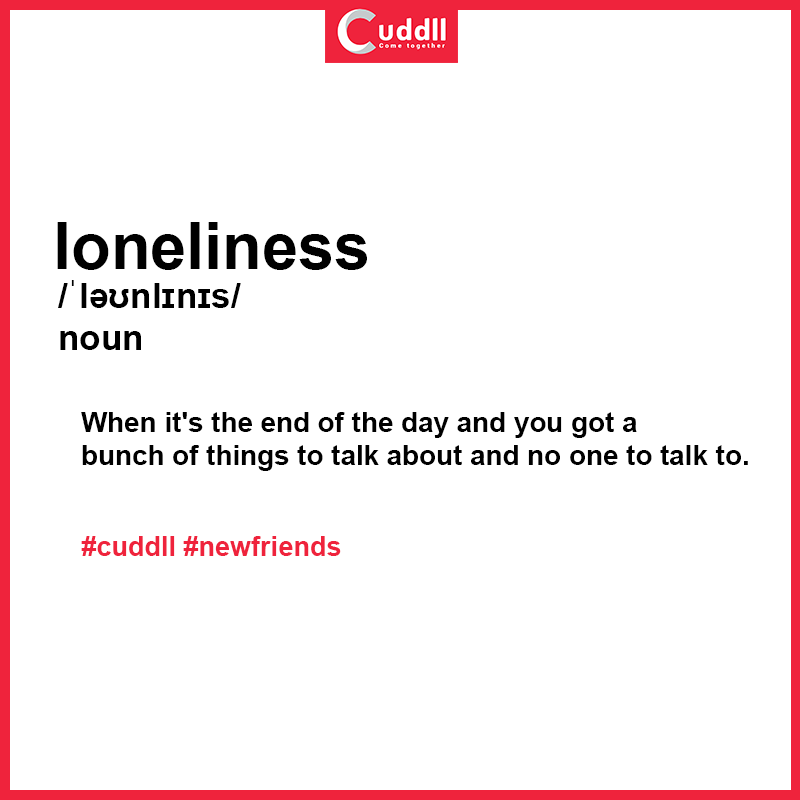 I think it’s nice to have an app like Cuddll that can help you find new friends to spend some time with! This type of feature can also be available at other platforms and apps but I like Cuddll’s presentation more. It’s centered and geared towards mind-liked people who really aren’t into half-hearted commitments. Being alone in a strange town or city can really drive you into a corner! Interesting. I have never heard of cuddle before. I love the concept behind this app. I will have to check it out. I never heard of this before but in this day and age technology seems to be how many people meet each other so it’s a really good idea. This is an interesting concept. Because our world is so digital these days, it only makes sense to have apps that facilitate meeting people. Wow, I never heard of this! Sounds kind’ve cool and interesting! Never heard of Cuddll before! Glad to know that there is an app available to meet all the like-minded people! I have never heard of such a thing! What a great service for people who are in need of friendship. Thanks for sharing this. I haven’t heard of Cuddll before. This is a great post, introduces Cuddll to your readers. Looks like a new and wonderful service to find new friends. I will check it out for sure. This looks like an app that will really help a lot of people. I like the concept of it, such a lovely idea. It sounds like a great app. I wish I had this when I moved to a new country and didn’t know anyone. Back then I used Couchsurfing to make friends, but the problem with this website is that they always go, never stay in one place long term. I’ll have to tell my niece about this app. She just moved across the country from all her friends and family. That’s very interesting! Especially for those who find it difficult to get out of their group of colleagues and friends who may have moved on to different stages in life or are too busy. I certainly would have loved this back when I was fresh out of school! This is my first time to hear this app. and it looks interesting to meet new people. I really love it. So useful. This Cuddll app looks interesting and helpful to find new friends. I will give this a try. This is actually the first time I heard about this app and it’s kinda interesting to meet new people in your area. Whenever you moved to a new place, in the highly crowded people you feel lonely !!! Apps like Cuddll are cool to find a friend!!! And I will love to sing your version of “Shape Of You” !!!! Oh wow, I’m attached, so this might not be an app my partner will be happy knowing that I’m in. But it definitely sound like a great app for me to introduce my single friends to! This app looks interesting, and simple to use. Is this similar to app Meetup? I agree the irony, we are very sociable online but not offline. This looks like a great idea. i think i should download, being an introvert like me.Such a great way to meet people and hang out who are like minded. This looks great and helpful for someone who feels lonely most of the time. I am going to share this! I can see how this app can be helpful but there are so many apps that started this way to be strictly for meeting friends and being more social and it seems to take a turn way into left field. Hope this one stays for what it is becuase it sounds good. I am very intrigued by this. Since I have moved to a town an hr away I don’t know anyone. My bf has met people but I am struggling. This would be a great app! I have never heard of this but I have got to say that the world has gone so digital to help people with loneliness and its an area we all struggle with.